Axis Mobile Monitor software enables quick and easy access to live video from Axis network video products, directly on smart phones or Pocket PCs. It increases the flexibility of the installed cameras, not only for viewing live video but also for versatile camera management. 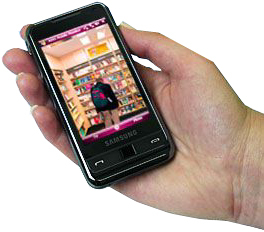 Axis Mobile Monitor makes mobile surveillance convenient on handheld devices running Windows Mobile. Designed with ease of use in focus, this software offers easy installation and setup with automatic discovery and flexible configuration of cameras. With intuitive user interface, Axis Mobile Monitor provides pan/tilt/zoom operation and manual control of I/O ports. Axis Mobile Monitor also simplifies the physical installation of Axis network cameras when focus and direction need to be set or adjusted. [Find out more...] Axis Mobile Monitor "Technical Data Sheet", 927 kB pdf file. To view the .pdf file, you will need the free Adobe® Acrobat® Reader or plug-in. If you do not have Acrobat Reader, please select the "Get Acrobat Reader" icon for further instructions. [Download Axis Mobile Monitor...] Axis Mobile Monitor Version 1.0.9 (latest version), 1,588 kB "Windows Installer Package". [Download Axis Mobile Monitor Release Notes...] Axis Mobile Monitor Release Notes, 6 kB "Text File". Axis IP-Installer Utility is a software application that quickly and simply installs Axis network video products onto your local network. Axis Camera Management is a powerful and efficient installation and management tool for use with Axis video products.